For 17 days in the summer of 1982, Barry Prudom was the most wanted man in all of England. Barry’s uncanny ability to blend into the woods of North Yorkshire and evade capture, even when hundreds of polices officers were searching for him in a relatively small area, earned him the nickname “The Phantom of the Forest”. 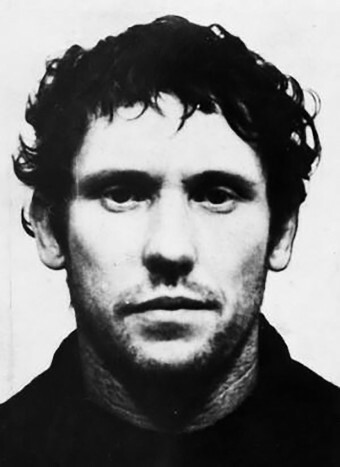 According to the British papers who dissected his life following his short, bloody stint as a fugitive, Barry Prudom had “an unremarkable youth” that was punctuated with bouts of criminal mischief that more often than not landed the youngster in trouble. Born in Leeds in 1944, Prudom was the result of an illicit and short-lived affair between a dressmaker and a soldier. Prudom’s father abandoned the pair shortly after his birth and was never heard from again by Barry. Although Prudom had infrequent run-ins with the law during his childhood, including one notable time he was caught breaking into someone’s home, he was able to secure an apprenticeship as an electrician soon after leaving school, a career he reportedly showed some promise in. However, Prudom’s real passions were guns and the military and it’s reported that he consumed media relating to both of these subjects with an obsessive level of fanaticism. This culminated in Prudom joining, in 1969, a voluntary reserve unit of the Special Air Service (the sister unit of the legendary, but somewhat lesser known, Special Boat Service, which as we previously covered had something of an interesting start). Exactly how much Prudom learned during his time with the SAS isn’t clear because of how notoriously secretive the service is and because of conflicting reports from the time. While some sources state that Prudom was summarily dismissed for lack of discipline, others describe that he was committed enough to make it to the final test- no small feat that- barely failing to become a fully fledged member of the famously well-trained and elite fighting force. Another reason there’s confusion over how much Prudom learned during his time with the SAS and how much was learned on his own is that later raids of his home found a well thumbed copy of No Need to Die, a bible of survival techniques written by survival expert, former SAS instructor, and former paratrooper, Eddie McGee. It would also be later revealed that Prudom attended at least one course held by McGee on the subject of living off the land. After his failure to make it into the SAS reserves, Prudom settled down somewhat and earned a respectable living working on oil fields in the Middle East to support his growing family. However, this all came to abrupt end in 1977 when he returned home to find out his wife had left him for another man. On top of that, there was the unexpected drowning of his mother a few years earlier which is thought to have been another catalyst to his apparent mental breakdown. After divorcing his wife, Prudom became a violent “swaggering bully” who travelled across the US and Canada with his new girlfriend taking work when and where he could. It was during his time in the US that Prudom was able to get his hands on a gun, which he was inexplicably then able to smuggle back to England sometime in the 1980s. In January of 1982, Prudom was arrested for nearly beating a man to death with an iron bar in his hometown of Leeds. However, prior to being tried he posted bail and absconded. It’s from here that the subject matter gets a little more disturbing. A few months after jumping bail on the 17th of June, Prudom was laying low on the outskirts of Leeds when Police Constable David Haigh, who’d originally set out to deliver a simple summons to a poacher, came across him. What exactly transpired isn’t known, but a few hours later, PC Haigh was found by his colleagues laying dead by the open doors of his car, felled by a single bullet to the head. Investigating officers examining the scene found a clipboard next to Haigh’s body on which a car’s registration details and a name were written. Both leads quickly turned cold as the car was later found burned out in field and was reportedly bought in London a few months earlier for cash; the name on the clipboard, Clive Jones, turned out to be a fake. Three days after killing PC Haigh, Prudom had made his way to Lincolnshire where he broke into the home of an elderly woman and stole a grand total of “£4.50” from her purse. Though shaken, the woman survived with no real injuries. This, sadly, can’t be said for the elderly couple who owned the next home Prudom crashed three days later. After tying up and robbing the terrified elderly couple, Prudom shot both of them in the head. While the 52 year old husband died instantly from his wound, his 50 year old wife miraculously survived, although she suffered from brain damage that made her unable to recollect the horrifying encounter. Prudom’s spree continued and over the next few days he injured a police dog handler called Ken Oliver and killed a third officer called David Winter. In case your opinion of Prudom at this point wasn’t low enough, he also shot Ken Oliver’s dog, which despite being hit twice, made a full, fuzzy recovery. But here’s the part that made Prudom’s story so terrifying for the public- after the attempted murder of PC Oliver and his dog, Prudom fled into the woods which, “within an hour” were flooded with over a thousand police officers. And yet somehow, Prudom was able to escape. This impossible escape paralysed the local area with fear and for several days afterwards, people in the surrounding area stayed blockaded in their homes. It’s reported that some people even left their keys in their cars so that Prudom could just take them without incident. Four days after evading capture, Prudom killed PC Winters after being stopped for routine questioning; again, despite hundreds of officers descending on the area, he slipped away undetected. Sometime between the attempted murder of PC Oliver and the murder of PC Winters, Prudom had been identified as the murderer and officially named as the subject of what was, at the time, the single largest armed manhunt in British history. This was made possible thanks to a slip-up on behalf of Prudom. You see, although he’d given PC Haigh a false name, he had given the officer his real date of birth, which had been subsequently noted down on his clipboard and it was this vital lead which allowed officers to make the connection between Prudom and the string of crimes he’d committed since. After learning Prudom’s true identity and learning about his military training and obsession with survival tactics, the police knew they were in over their heads and decided to reach out to someone they knew Prudom couldn’t hide from- Eddie McGee, the guy who’d literally wrote the book on survival Prudom was using to evade the police. McGee, who had sons serving as police officers in the area, readily agreed to lend his skills to the police. The police then deployed even more officers on the scene, surrounding the town of Malton, the last place he’d been seen. Little did the police know, Prudom was literally yards away from the local police station watching images of himself on a television in the home of an elderly man called Brian Johnson that he’d taken hostage. Through these television reports, Prudom learned that McGee was trying to track him and that the police were searching for him in a local wood. What Prudom didn’t know is that the police had been intentionally feeding the media false reports to make him underestimate the size of the force hunting him as well as muddy his idea of where their efforts were focussed. Upon leaving Johnson’s house, Prudom carefully laid out a false trail to confuse McGee and took refuge under a piece of plastic sheeting. After Brian Johnson managed to free himself, he contacted the police and McGee began investigating the scene. He quickly saw through the false trail Prudom had laid and was able to track him right to his location, sneaking up behind him and stealthily putting a hand on his leg to confirm he was there before sneaking off again. After retreating, McGee informed the hundreds of officers gathered that he’d found their man, only to hear the unmistakeable sound of a gunshot. The police answered with a volley of their own, and after silence fell, they went to check on Prudom’s location, where they found him laying dead. After a brief investigation, it was discerned that Prudom had died by his own hand, though he had several pieces of shotgun buckshot in his body as well. A bloody end to 17 days of fear that had gripped the nation. How Did “911” Become The Emergency Call Number in North America? “No Need to Die” was published in 1995, thirteen years later. The original version of the book, which is presumably the one Prudom owned considering his fascination with survival and military tactics, was published some time the late 70’s and has been re-published several times since, including once in 1995. I’m not sure exactly when the book was first published, but the earliest version I could find is from 1978 and it’s listed as a reprint, so it’s pretty safe to assume it existed long before Prudom’s crime spree and that he had a copy. Especially when it was such a key part of the case. When did 50 and 52 years old become ELDERLY? Interesting story, but probably all drownings are unexpected and people in their 50’s aren’t exactly elderly. Sorry…these sort of things distract me☺.